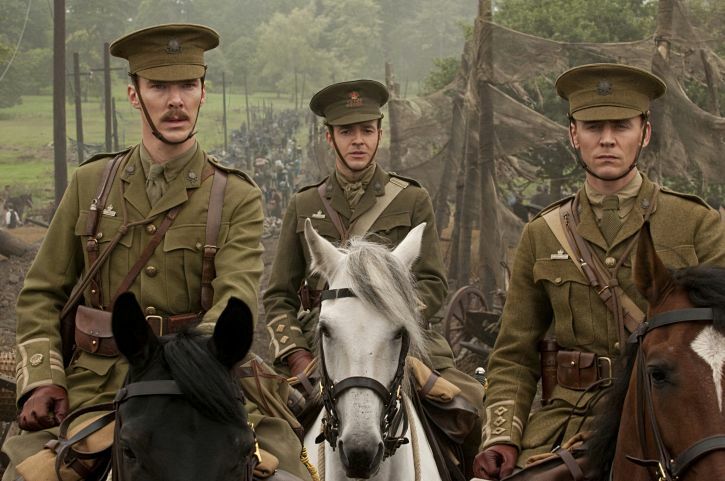 "War Horse" is one of those films that is immediately expected to have the stuff award contenders are made of. Really though, there is nothing about this film that makes it greater than most of the other above average movies I've seen this year. There is nothing that puts it ahead in the race. It is a movie that starts off in one direction and then, as we settle in to what it seems to be carving out we are jolted in the complete opposite way. Granted the new turn has a lot more excitement and is able to find its footing quicker than the tedious exposition did; still it just never quite seems to gel. The film is a perfect example of a good movie that just isn't as good as what we all expect it to be. Take Steven Spielberg's other release this year, "The Adventures of Tintin" which I saw yesterday. In the whole scheme of things is this as good a film? Does it merit as much heart or emotional pull from the audience? No, but does that make it worse than "War Horse"? No. These are two different films with two different objectives. "Tintin" simply succeeds more in meeting the demands of the style in which it operates while "War Horse" does not. "War Horse" is by no means a bad movie, it is a carefully crafted drama that has a master filmmaker doing what he does best. He is telling a simple story about a boy and horse that are surrounded and broken up by the events of the world we live in. It is one part (supposed) tear-jerker, one part war story, and all in all attempting to be a film the whole family can see. The formula for this more serious side of Spielberg fails him this time, but not because he doesn't know what he is doing but simply by the fact he doesn't feel invested. 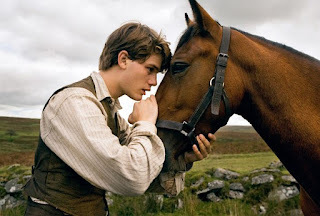 Albert (Jeremy Irvine) has a special bond with his horse Joey. 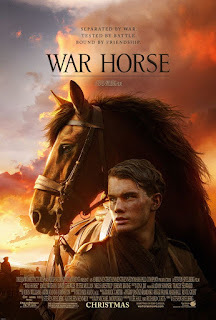 Having not been familiar at all with either the novel this film has been adapted from or the recent stage play that has seen great success I mostly went into "War Horse" blind as to what would be going on. All I had to go on was what I'd seen in the trailers; and if you've seen the trailers you know there isn't much story divulged. I guess I should have expected nothing more than to see the trials of one particular, special horse and its journey through many years; from its birth to its long and strange journey through the first world war but I guess I thought there would be more to it. What we have is indeed that simple though. The film opens with the birth of a part-thoroughbred horse that is won in an auction by a local farmer whose boy admires the young colt. The farmer, Ted Narracott, buys the horse in spite of his landlord Lyons (David Thewlis) trying to outbid him and in spite of the fact he came looking to purchase a plough horse. This sets up early conflict within the Narracott household, but Ted's son Albert swears to raise him right and teach him how to plough. The extended exposition I mentioned earlier takes place here. Building the relationship between Albert and the horse that he calls Joey. All the fuss over whether the horse will plough enough land to produce enough crop to pay for the rent is quickly forgotten when the war begins though and Tom goes ahead and sells Joey to the military in order to make the rent. Albert is clearly heartbroken and here in lies my big issue with the movie overall. I get it, the kid raised the horse, he taught him everything he knew, and he loved the animal but the way in which this is portrayed is overly sappy and to be honest, a little strange. I couldn't escape or ignore the fact Albert was a little too sentimental when he had to let Joey go, especially considering the reasons he had to part with him. Even when the Captain who purchased Joey promises to take good care of him I couldn't help but feel a disconnect to the events being depicted and how it would have happened were this more of a gritty, honest portrait of life in those times. Once Joey is sold to Captain Nicholls (an underused Tom Hiddleston) though the story takes a tonal shift for the better and the more interesting. At this point the movie became an entirely different entity and for me, raised the bar on what looked like it might have been too slow of a burn for me to even make it through. Joey is trained for military operations but is quickly disconnected with his new owner when Captain Nicholls is killed in battle. Thus beginning a journey that will take Joey from the British military over to the Germans and from the Germans to a young French girl named Emilie. Emilie lives with her grandfather but is unable to keep her new found friends when the German army arrives and takes everything they have. The story then shifts back to Albert who has now joined the British military. From here we know where the story is heading and despite knowing what a knack Spielberg has for shooting battle sequences the ones we experience in "War Horse" are devoid of any kind of feeling. This seems due to the fact that because so much of the focus lies within the horse and the way it affects the people, the human beings it comes into contact with that we forget the two sides the soldiers are fighting for. Never mind we are never given a history lesson in why the war started (it really isn't necessary, but might have aided the narrative). This could be taken as a lesson Spielberg is trying to teach in its own right, that there is no black and white, there are no absolutes, and to take differences to such an extent shows how juvenile a species we are. It is valid argument, a statement the movie makes that begs the purpose of war in the first place is put front and center when opposing soldiers free Joey from a barbed wire entanglement. It is the highlight of the film and it speaks volumes. It is the one moment in the film I truly felt involved and genuinely cared. It is just a shame that reaction came so late in the film. celebrate her birthday together with Joey. The film is a beautiful to admire as Spielberg and his cinematographers capture the essence of the time period and operate with lush reds and purples that are drastically contrasted by grays and greens when the film makes its ways into the more heavier scenes. For all of the beautiful photography though it cannot distract from the lagging depth the story experiences. At two and a half hours "War Horse" asks a lot from its audience especially with its tepid pacing and flat characters. Newcomer Jeremy Irvine plays our "hero" Albert and though Irvine possesses a natural and authentic persona he never comes off as more than one note when we should see the experience of losing his best friend take him from an ambitious farm boy to a jaded soldier that is redeemed by fate. This could be due to the fact that his character doesn't appear for a huge chunk in the center of the film , but I prefer to think that extended opening should have been plenty of time and in the end I wasn't impressed or moved nearly as much as I should have been by the connection, the bond that Albert and Joey shared. Since "Schindler's List" Spielberg has had a hand in deeper subject matters, proving to be more an artist than pure entertainer. He did this with "saving Private Ryan" and for me, coming into young adulthood I took in "Munich" with a sense of a director who really had an investment, a connection with the story he was telling. This was for more than the purposes of making a movie, but it was to create an experience that helped he and others like him discover things about the world and about our lives. "War Horse" seems like it would have been the logical next step in a career that has navigated so well between the artsy and the fluff. 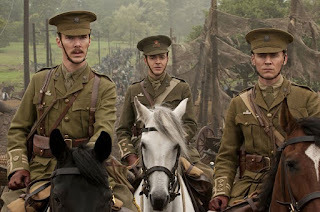 Instead there is no nerve that "War Horse" hits, it is a pure Hollywood concoction coated with the looks and credentials of something much deeper.